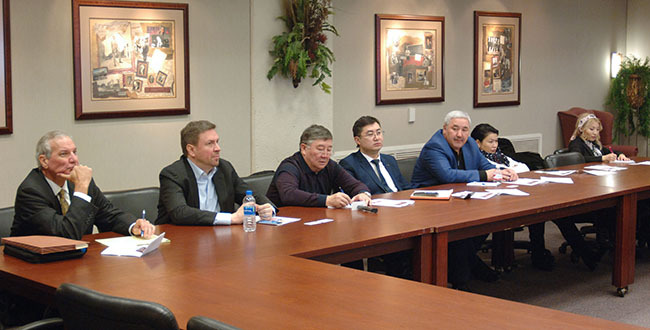 Members of the Kazakhstani delegation listen to forensic science experts and others in the Hendricks Heritage Room at the University of Houston Law Center. Dec. 14, 2017 — Developments in criminal law were the focal point for the U.S.-Kazakhstan Roundtable Discussion on Texas Innovations in Forensic Sciences recently last Friday at the University of Houston Law Center. Opening remarks were delivered by Associate Dean Greg Vetter and Professor Sandra Guerra Thompson, director of the Criminal Justice Institute. "We in Houston as a city and at the Law Center are very, very proud of what Houston has done with forensic science," Vetter said. "We're particularly proud of Professor Thompson's role in transforming and improving forensic science in Houston and also our visiting Professor (Nicole) Casarez's role as well." "We hope the discussion fostered an exciting dialogue for the mutual betterment of our systems of forensic science and our legal system," Thompson added. The opening speaker was Casarez, chair of the board of directors at the Houston Forensic Science Center, which is Houston's independent forensic laboratory. She discussed the progress the center has made, including its efforts to battle wrongful convictions. The second topic focused on the role of prosecutors in uncovering wrongful convictions. The speaker was Inger Chandler, the former chief of the Conviction Integrity Unit of the Harris County District Attorney's Office. The third topic, "Investigating Past Convictions to Redress Wrongful Convictions due to Unreliable Forensic Evidence," was led by Robert Wicoff, chief of the Appellate Division of the Harris County Public Defender's Office." Lastly, the Honorable Judge Barbara Hervey addressed the role of the Texas Criminal Justice Integrity Unit in providing leadership on statewide efforts to correct wrongful convictions caused by unreliable forensic evidence, as well as in providing educational programs. Hervey serves on the Texas Court of Criminal Appeals. The visit was sponsored by the Kazakh Ministry of Justice and the World Bank. Following the discussion was a dinner and reception in the Albertus Room.